Horticulture 1: Gettin' our Garden Groove on! Students in this class enjoy working outside, going on weekly Plant Identification walks, installing gardens, learning about plants, and EATING! We usually go on a field trip to learn more about agriculture and students all have a 20 hour project that takes place outside of class, related to agriculture and natural resources, called SAE. 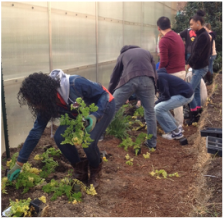 Here are some of the spring 2013 students planting parsley and chives along the greenhouse. These students are also really important in the cultivation of a number of greenhouse crops like: poinsettias, Christmas cactus, and all of the spring flowers and vegetables for the annual spring plant sale at WHS April 20th through the 24th, 10am-5pm. 2. Get your bellwork and do the first day. ​3. 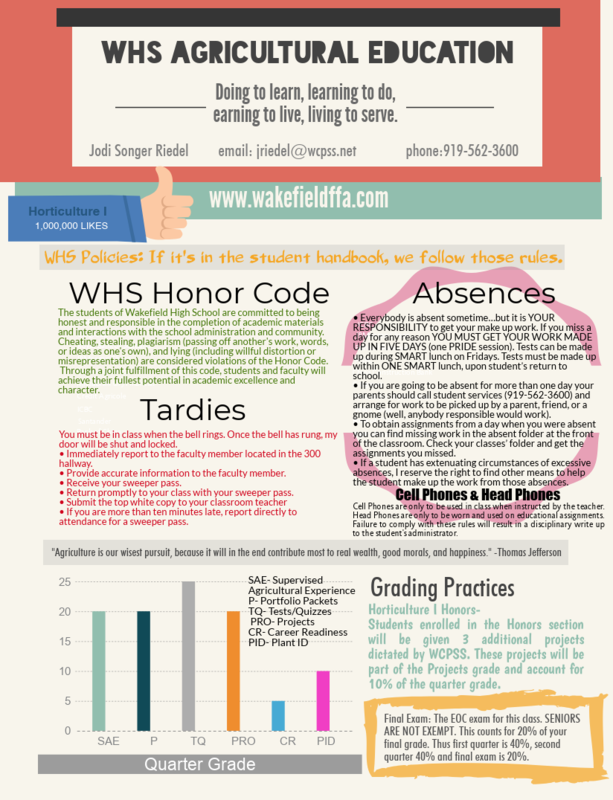 Make a Why Horticulture poster. 1. Do the bellwork for Day 2. 2. Finish the poster if you haven't. Submit the poster on Google Classroom or in turquoise bin. 3. 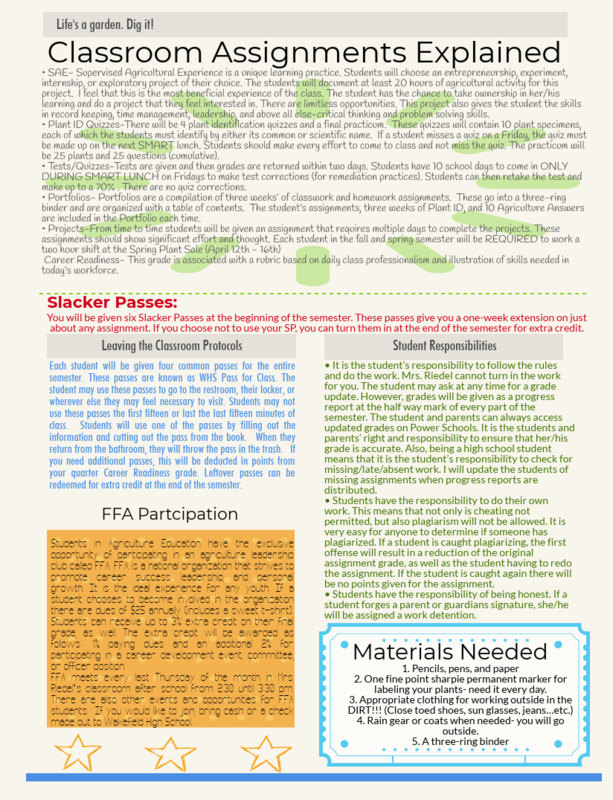 Work on FFA Overview on Google Classroom. You should have a copy in your account. *If you are enrolled in another Agricultural Education course today or in the past, please do the Summer FFA New Horizons and choose 2 articles and their activities. 1. Do the bellwork for Day 3. 3. Begin SAE Video Choice Board. SAE Projects are due on 9/21, 10/16, & 1/03. Plant ID Quizzes take place on three days- 9/28, 10/19, 12/7 & 1/4/2019. The first three quizzes are cumulative with 10 plants and fifteen multiple choice questions. The final plant id practicum (big quiz) takes place on 1/4/2019 and has 25 plants and 25 multiple choice questions. To the right, you see this amazing Why Horticulture Poster? This was made on Piktochart. In Horticulture, on Day 1, you will need to create one of these amazing pieces of art and justify why horticulture is so important. Here is some additional information to help you figure it out! 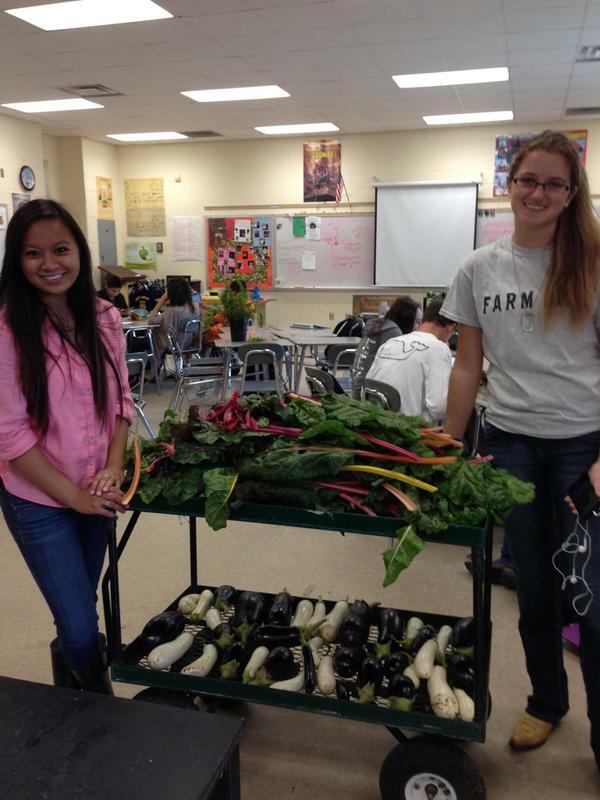 Phoebe Ortega and Alisia Harper yielded some serious harvests when they were in Advanced Studies because of all of their hard work and incredible knowledge gained in Horticulture I. They started out green, with very little gardening experience, but as you can see, they really got growing! Classwork and assignments is all available on this website. Lost it? Find it here! Each week students will investigate new plants. 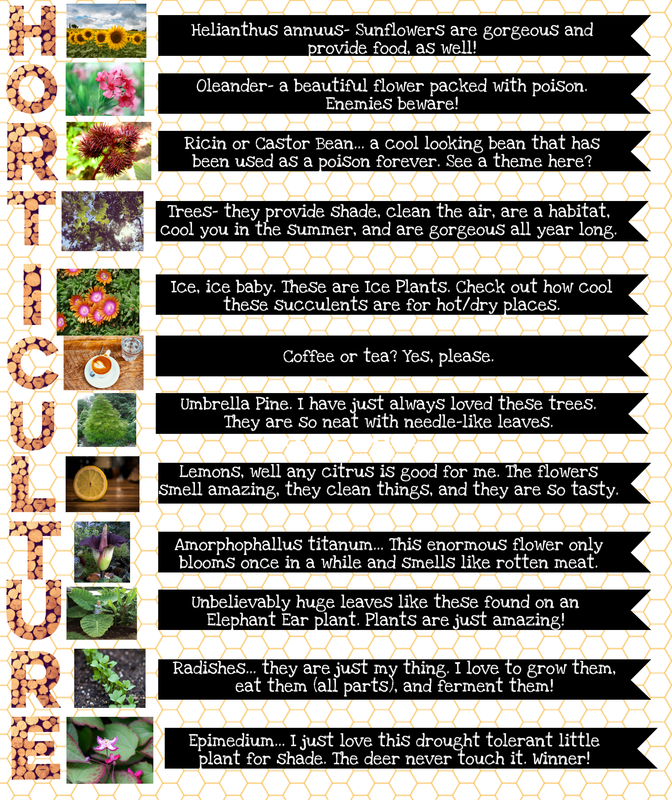 They learn their botanical and common names, identifying characteristics, and then go out and see them in person. On four Fridays, they are tested on 15 of the plants and it is always cumulative. Plant ID Quizzes can be a breeze if you are prepared. Students need to have their Plant ID notebooks filled out each and they can use those notebooks on every quiz. In addition the final quiz is 25 plants and 25 multiple choice questions. They may turn in extra credit (slacker passes, bathroom passes) so that they can add points to the quiz or what I call the practicum. SAE or Supervised Agricultural Experience is a major component of the class (25% of the student's grade). Make sure you familiarize yourself with weekly requirements. Use the SAE pages on the menu above. The basics are you need: 15 hours outside of class related to the agriculture or natural resources industry, you need to keep track of those hours, you need to take pictures of those hours, you will make a virtual of tangible poster at the end, you will write a one-page paper about your experience at the conclusion, and you will submit your finalized SAE Recordbook with receipts, hours, and information about your experience. Check out the SAE on this site for more information. Every unit will end after the test and a Portfolio Packet will be turned in. In addition, you will turn in your Bell Work at this time. Bell Work is found on this website, as well. Students are graded on their professionalism daily. Students are expected to illustrate qualities and demonstrate skills that would be expected of career professionals. Agriculture is part of the Career and Technology department. Exemplary work behaviors are demanded in the workplace and in the classroom.